A Stronger Asset - News - Resources - Allied Commercial Real Estate, Inc.
New sources of capital and increased demand have strengthened the commercial real estate market. The current economic landscape has assembled an array of factors to structurally change real estate investment standards. The intertwining of the U.S. and global economies, deeper integration of liability and equity markets, and the accelerated adoption of real estate investment trusts and commercial mortgage-backed securities as major components of the sector have all contributed to this evolution. Furthermore, increased access to a variety of capital sources, combined with a multitude of real estate investment vehicles, has resulted in real estate investment earning its place as a mainstream asset class. For today’s real estate investor, advanced facts and figures, deeper liquidity, and a range of broad investment opportunities that reach beyond merely primary metros have all allowed the further mitigation of risk. As supply cycles continue their two-decade trend of stabilization, the sector remains less volatile as a whole. Convergence of these influences has refined the foundation for attractive real estate cost positioning, resulting generally in falling capitalization rates over the last 20 years. Typically, cap rates are inclined to stay range-bound during economic inflection points, with a usual variance of between 100 and 130 basis points. Whereas the length and severity of the the 2009 Great Recession and the 2001 Recession were markedly different, the recovery trends of cap rate performance proved surprisingly similar. During the peak of the financial crisis, cap rates expanded from 6.9 percent to 8.1 percent between 2007 and 2009 before making a remarkably accelerated recovery, especially given the depth of the recession, according to figures from Real Capital Analytics, CoStar, and Marcus & Millichap Research Services. While the annualized yield on the 10-year Treasury declined 280 basis points to 1.8 percent between 2002 and 2012, the mean annualized cap rate for all property types dropped 150 basis points. Since the end of 2012, the 10-year yield has abruptly expanded 100 basis points to 2.9 percent as of September 2013. 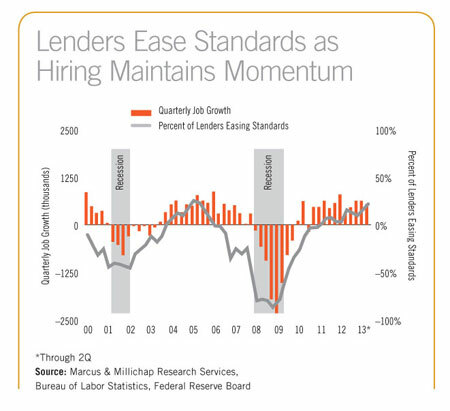 In evaluation, the mean cap rate proved more steady, edging down only about 10 basis points to 7.2 percent. While a delayed effect is still a possibility, forecasting the potential magnitude requires deeper analysis. Throughout the Great Recession, the Federal Reserve has held the federal funds rate to nearly zero while infusing huge volumes of capital into the financial markets. The expanded period of monetary easing and the absence of government-supported distress sales have boosted the national mortgage market. This paved the way for cap rates and real estate values to bounce back far more quickly than in previous recessions and well ahead of an actual operating recovery. The exception to this trend occurred in multifamily properties, which recovered even faster than the other sectors. Whereas tough credit underwriting continues to be an obstacle for potential borrowers, the Federal Reserve’s accommodative policies aimed at reducing near-term interest rate risk have aided in the refinancing and restructuring of maturing and difficult loans. This has resulted in more capital entering real estate as a comparatively sound alternative to reduced yield bonds and volatile equity markets. Since the market bottomed in 2009-10, commercial real estate investors have favored the greater certainty of top-tier markets and properties with proven cash flows, despite their generally lower yields; this focus on prime markets limited meaningful price recovery to coastal and urban core markets, until investor interest began to spread a year-and-a-half ago. With most gateway primary markets having substantially recovered, occupancy and rent growth momentum has expanded to late-recovery secondary and tertiary metros. These areas may garner higher yields and offer room for net operating income gains, but they also carry higher risk. Many of these areas face relatively higher overdevelopment threats, less consistent demand, and more shallow liquidity, all of which could affect investor exit strategies. 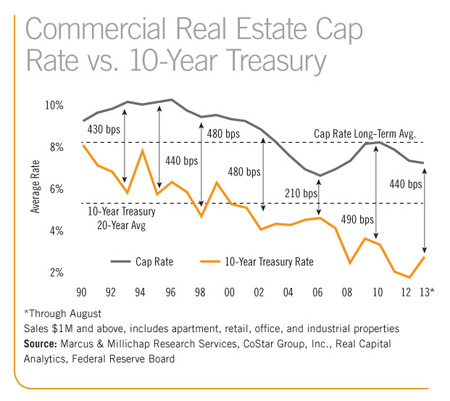 Reflecting these trends, the maturing primary markets have faced slowing cap rate compression and even rate upticks. Conversely, cap rates in secondary markets have tightened, supported by stronger operational momentum and sales volume. Naturally, investor risk will depend in part upon a market’s position along the arc of the real estate cycle and the investment time horizon. The hybrid nature of commercial real estate makes it a compelling investment option, with a bond-like cash flow component even during economic downturns, as well as an appreciation component that often acts as a hedge against inflation, considering that property owners benefit from increasing rents and property values when inflation rises. In addition, many long-term leases contain consumer price index rent increases, while shorter-term leases allow investors to quickly adjust to market rates. A period of falling cap rates helps elevate returns via appreciation. Rising interest rates — reflecting stronger economic activity — generally exert upward pressure on cap rates, requiring an increased emphasis on income growth to offset slower appreciation and higher financing cost. However, healed and expanding credit markets, strong global investor demand for U.S. real estate, and continued recovery in property fundamentals will help counterbalance the magnitude of rising rates, and lend support to property values. Having already absorbed a significant increase in interest rates, further cap rate changes should tie less to speculation regarding Fed policy and correlate more with measurable economic performance. Debt and equity markets should remain stable for the foreseeable future. However, the environment is not without risk, and near-term volatility should be expected. The pending appointment of a new Federal Reserve chief, looming debt ceiling discussions, geopolitical tensions in the Middle East, and the effects of sequestration and declines in federal spending will hamper economic growth. In addition, changes in monetary policy always present a risk to the economy. In this light, the Fed has demonstrated considerable dexterity, and should gradually exit qualitative easing in an orderly manner by slowly decreasing bond purchases and letting some securities mature. The Federal Open Market Committee has issued interest rate guidance, stating that the federal funds will remain range-bound between 0 to .25 percent at least until mid-2015, underscoring that monetary tightening would begin only after an economic and employment recovery has been well established. The Fed also noted that the tightening process would occur at a more gradual pace than historical precedent. Surely, higher interest rates will impact investors across the board. As financing costs rise, so will investors’ required returns. At a minimum, increased financing costs will decay some of the cap rate arbitrage of buying into secondary and tertiary markets, or value-add and opportunistic assets. However, the stride of occupancy and lease growth is likely to exceed that of primary markets and core assets for the midterm outlook. 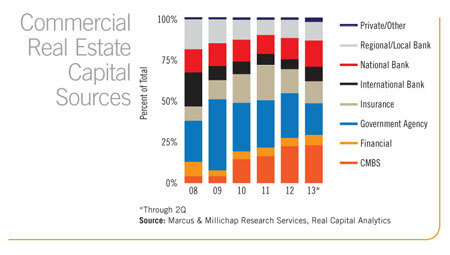 Demand for all commercial real estate, sustained by the reinforcing economy, remains solid, and supply risks are negligible for most property types. As a result, performance profits and other components will considerably counteract the effect of rising interesting rates, at least for the near term. William Hughes is the senior vice president and managing director of Marcus & Millichap Capital Corp., based in Irvine, Calif. Contact him at %3Ea%2F%3C6000ps4000pspahcillimsucram1000pssehguh4000psmailliw%3E%22%3B%29561%20%2C611%20%2C17%28bgr%203000psroloc%20%3Benon%203000psnoitaroced-txet%20%3Bxp0%203000psgniddap%20%3Bxp0%203000psnigram%22%3Delyts%20%226000ps4000pspahcillimsucram1000pssehguh4000psmailliw3000psot2000ps%22%3Dferh%20%22ot2000ps%22%3Dssalc%20a%3C.